The 10 Best Things to Do in Prescott, Arizona! There’s no denying that Arizona is a great tourist destination. Phoenix, Tucson, Flagstaff, and Sedona are all highly popular cities for people to visit during a trip to the Grand Canyon State. But one Arizona city is oft forgot in the conversation of great tourist destinations: Prescott. This northern Arizona city is located only two hours from Phoenix and is home to a treasure trove of history, activities, and adventure. 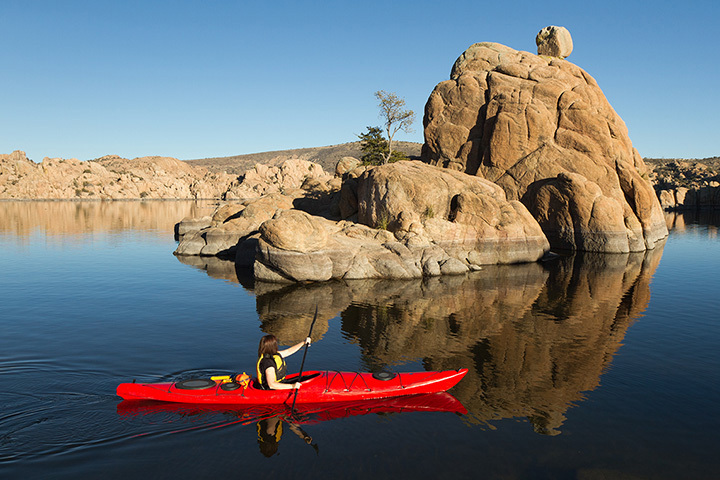 Here are the best things to do on your next visit to Prescott! Downtown Prescott looks like a throwback to a different era. Right in its center lays the Courthouse Plaza. This gorgeous courthouse is the glue that holds downtown Prescott together. It’s comprised of gorgeous architecture, historic statues, and is even listed on the National Register of Historic Places. It’s also home to many special events throughout the year, ranging from outdoor concerts, to weddings and movie screenings. Enjoying Jazz night at Courthouse Square, Prescott. Curtindo um pouquinho de Jazz. Welcome to the Wild West. Tourists looking for a taste of Arizona’s famous cowboy era need only take a walk along Whiskey Row. Located in downtown Prescott, it’s a street comprised of western-themed saloons. It was once a hangout for cowboys during Prescott’s mining era. Today it exists as a relic to Prescott’s past. You can still visit many of the bars, restaurants, and shops located on Whiskey Row. Though it has notoriously hot summers, Arizona has some outdoor havens that are perfect for a summer adventure. One such location is Watson Lake. It’s located at Watson Park only a few miles removed from Prescott. During the summer, it’s home to pristine blue waters and temperate weather. This outdoor oasis is home to fishing, kayaking and canoeing. It’s also a great spot to camp and enjoy the great Arizona outdoors. Lynx Lake is like something out of a painting. The picturesque Bradshaw Mountains and a forest of pine trees surround this 55-acre lake. Located a few miles from Prescott, Lynx Lake is one of the more popular outdoor getaways for Arizonans. It’s home to cool weather, refreshing air, and a number of great fishing opportunities. Tourists flock here to fish for everything from rainbow trout to largemouth bass. Arizona’s history comes to life at the Sharlot Hall Museum. This central Prescott museum is dedicated to preserving the history of Yavapai County. You’ll find rare books, historic photos, and live demonstrations at this open-air museum. Sharlot Hall encompasses seven buildings, but it’s their gardens that leave a lasting impression. The renowned gardens create a beautiful setting for the numerous events and festivals located there throughout the year. Looking to experience Prescott? There’s no better way than hiking Thumb Butte Trail #33. This iconic trail is a 2.1-mile loop around a large granite formation. The hike is relatively moderate and remains a popular option for locals and tourists alike. The real treat is the panoramic views found on the trail. You can see the entire city of Prescott in addition to a slew of mountain ranges including Bradshaw, Sierra Prieta, and even the San Francisco Peaks. Whiskey Row’s bars and restaurants get all the accolades. But there’s another local watering hole that has should top your list of destinations: Prescott Brewing Company. This downtown brewery and restaurant is home to craft beer and a brewpub style menu. For over 20 years, Prescott Brewing Company has been home to great local beer, tasty food, and the best atmosphere in Prescott. The Phippen Museum is dedicated to Arizona’s rich culture and history. Their permanent exhibits include collections, artifacts, and memorabilia from the Wild West. Arizona comes to life in their many permanent and rotating exhibits covering everything from cowboys to Native Americans and horses. You can even walk down the Arizona Rancher & Cowboy Hall of Fame to learn more about Arizona icons at this underrated museum. Excellent exhibit at the Phippen! So beautifully done.